Fill a skillet with a 1/2 inch of water, add a splash of citrusy vinegar — Calamansi Balsamic was on-hand for this instance– or a squeeze of fresh lemon. Bring to a boil over medium / 60% heat. With scales down, cook the catfish for 4-5 min in the uncovered skillet. Flip the fish, add spinach atop, and cover. Cook another 3-4 min, or until the fish and greens are cooked. There should only be a little liquid remaining. 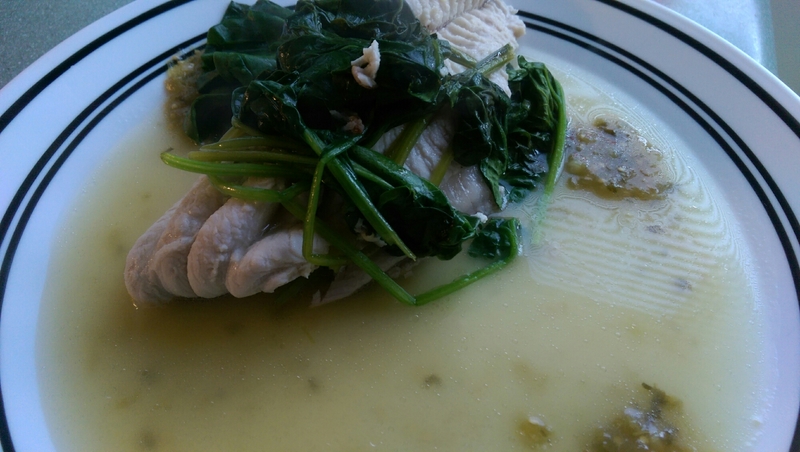 Using two turners, flip the fish and leaves onto a plate so the fish has a vibrant bed of green. Drizzle broth atop the finished product. Wow. How simple yet yummy looking!